Dashboards are a great way of keeping everyone on the same page and making sure everyone knows the status of the team on their activities. Sometimes, however, you will want to restrict what people see. Maybe you only want them to see their own statuses but not everyone else's. Maybe you don't want them to ever see any statuses at all because your dashboard has additional activities that you want kept private. Statdash handles both of these scenarios. When you specify that a dashboard is confidential, team members will still be able to update their statuses through their email link, but when they are finished they will be taken to a "thank you" page. 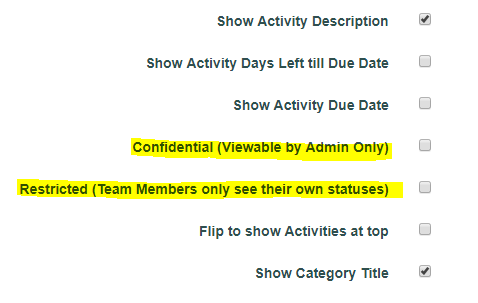 If you specify that a dashboard is restricted, then the team member will see the dashboard with all of the activities, but they will only see a single column with their own statuses for the activities. There are many instances where having confidential dashboards would be useful. An HR department may be soliciting certain demographic information from employees or they may be keeping track of employee skills. A marketing department may be soliciting feedback from a set of clients. Or a department manager may be keeping track of training requirements for their employees.